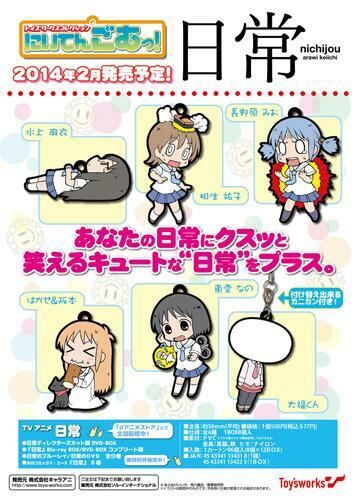 Nichijou’s rubber strap kitaaaaaaa!!! I’m glad Nichijou is still “alive” until now. Although the anime has ended already, but the toys for collections are still being produced (for limited amount). Yeah, Nichijou’s goodies are so rare. And I don’t have any. I’ve got this news from Shiraishi Minoru-san’s twitter who got shocked seeing Daifuku-kun’s (the last one in the picture) strap is also produced. Shiraishi Minoru is the voice actor of Sakamoto (the black cat in Shinonome household). For you who want to buy, go check this link to pre-order. It will be released on Feb, 2nd 2014. Not a really long to wait. After the announcement of the new game for PS3 console; THE iDOLM@STER “ONE FOR ALL”, the official site has renewal and announced the movie of iDOLM@STER. The movie tittle is “Kagayaki no Mukougawa e” (To The Shiny Side). This will be about a live concert in an arena. There will be also new characters in the movie as a back dancer. So I think the story will be a bit focused to these girls. The movie will be started to be aired in Japan nationally in January, 25th 2014.